Here's a SUPER quick and easy, clean and simple zombie card. Even zombies should get a Valentine card don't you think? I stamped the Distressed Backgrounds Splats with red ink then I used a couple of drops of the reinker mixed with a little water and splattered some additional splats. I did the same on a smaller piece of white card stock to stamp the ZOMBIES sentiment and matted that onto black card stock. I stamped the I and the heart directly on top of the splats and popped up the zombies sentiment on foam tape for some dimension. Do YOU love zombies? 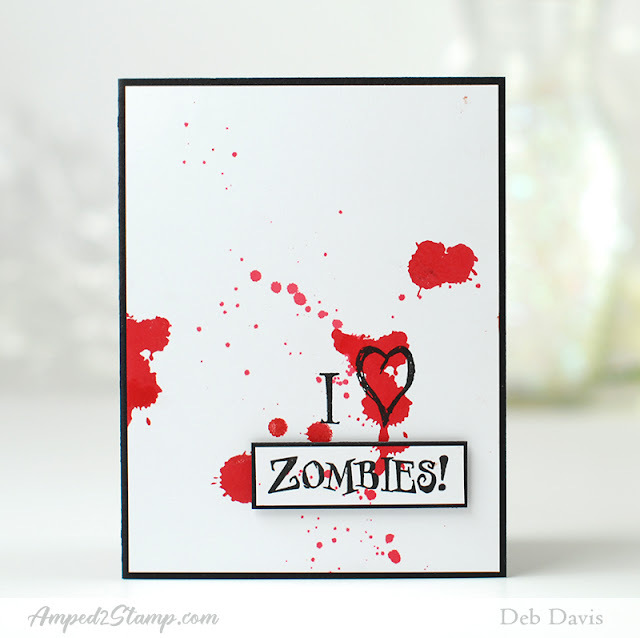 I'm sure you know someone who does and I bet they would love a zombie card from you ;) maybe even for Valentine's Day? okay all but that one - lol!